10:00 a.m. to 12:00 p.m. & 1:oo p.m. to 3:00 p.m. The Sussex County Master Gardeners are pleased to announce the opening of the Sussex County Garden Helpline for the 2014 gardening season. The Helpline is a free and valuable gardening resource for the residents of Sussex County. Master Gardeners are able to provide information and help on a wide variety of gardening topics including: lawns, vegetable gardens, perennial gardens, shrubs and insects. Call 302-856-2585, extension 535, to speak with a Master Gardener or leave a message. A Master Gardener will respond to your questions as quickly as possible. For questions regarding Master Gardener workshop registration, please contact Tammy Schirmer at (302) 856-2585 ext 544. 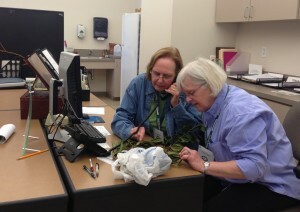 Plant samples may be dropped off Monday through Friday, 8:00 a.m. to 4:30 p.m. with the office receptionist.